Late 19th century, London, England, prominent mediums gathered for an historic tournament whose winner will be named the best clairvoyant of the century! Players will incarnate the finalists of this tournament. Their goal is to guess the cards in the hand of their adversaries to estimate how many cards of each category will be shown at the end of the game. But will bluffing, tactical playing and their divinatory powers make better predictions than their competitors? 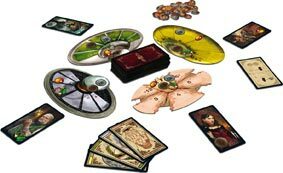 Divinare was a game that I picked up purely for the components; it had a great look and sounded interesting, and wasn’t too expensive, so I gave it a try. And I was not disappointed. It plays very quickly, a lot of moments had a very strong pokerface vibe, learning how to play your hand out as deceptively as possible. Highly recommended if the theme sparks any interest or bluffing is a mechanic you enjoy. 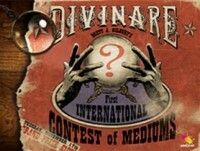 Add a Review for "Divinare"